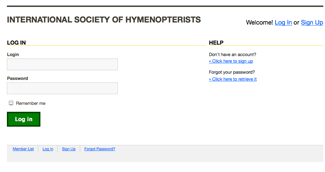 ISH membership renewal (family, student and individual) can now be done using paypal. You can use paypal to pay for your renewal using a credit card and do not need to have a paypal account. There is a flat rate of two dollars that applies for the paypal fees. We will be sending renewal reminders periodically and hope this service makes the process easier for the ISH community. Renewals will take a few days to process and you will receive notification by email concerning your addition to the ISH membership directory. Of course you are free to mail you payment in along with the renewal form found on the same web page. 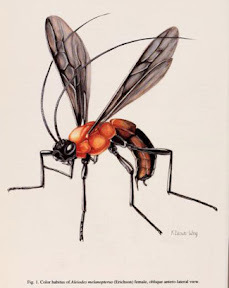 The 7th international hymenopterists conference in Köszeg, Hungary is scheduled for June 20-26 2010. George Melika created this great power point presentation as an introduction to the meeting location, facilities, and program to get us all acquainted. 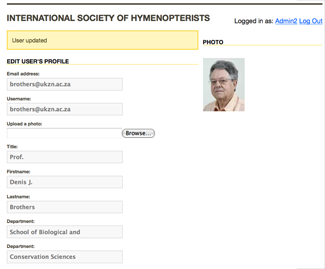 As part of our attempt to standardize the ISH members database we added a pick-list for the country names in the members edit form. This list comes from the ISO 3166 standard for country names. If you have concerns regarding the names please let us know. 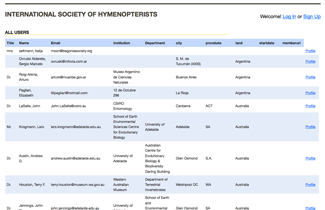 In the next few weeks the International Society of Hymenopterists website will change hosting companies. We are moving to Dreamhost because they provide free hosting for organizations with non-profit status and allow us to maintain our own member database. Please forgive any website downtime as we make the transition. 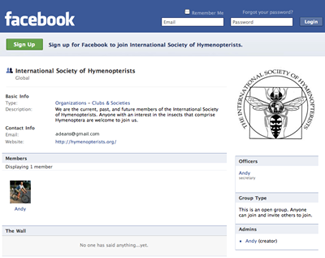 We have a new group on Facebook. We welcome anyone to join us!